Theatercaféen is an institution in Oslo. Few places have such a loyal clientele and so much history in the walls. Built, and later refurbished, in the beautiful Art Nouveau style, the café and restaurant date back to the year 1900. 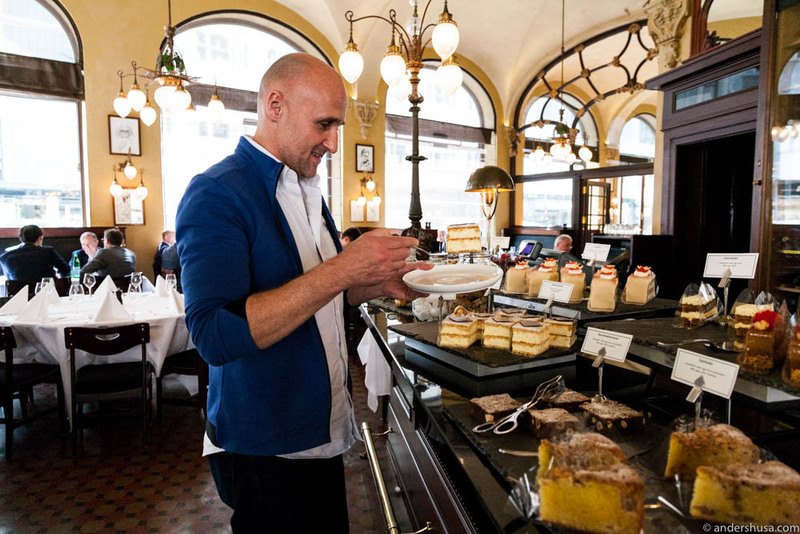 Throughout the years, it has been a popular gathering place for the cultural as well as the economic elite, and more than 80 portraits of the café’s most loyal customers decorate the walls today. 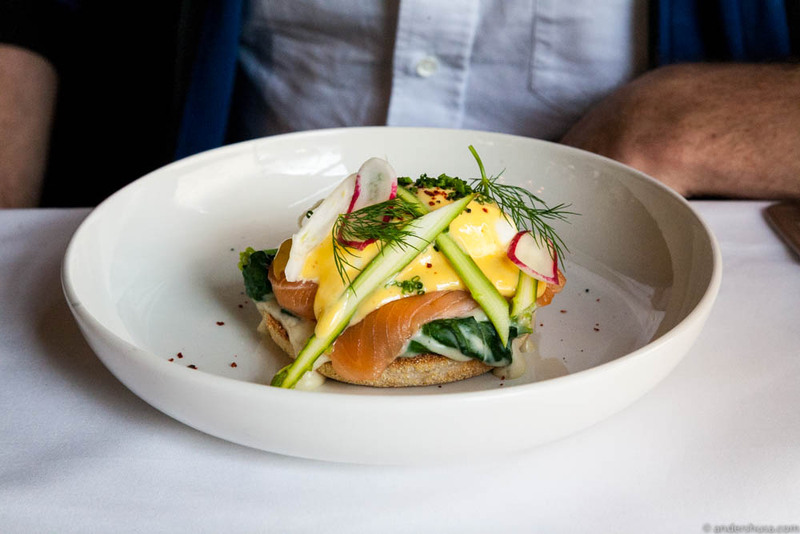 I recently enjoyed a lunch here with my friend, chef and cookbook author Ole Martin Alfsen, and was surprised to find that Theatercaféen’s classic open-faced sandwiches had gotten a modern facelift. 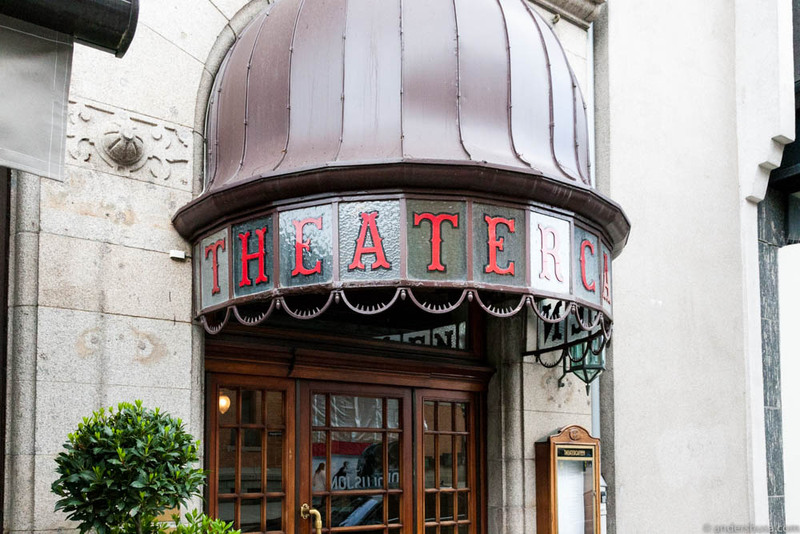 A few years ago I would have compared Theatercaféen, which is located in Hotel Continental, to other famous hotel restaurants in Oslo like Grand Café and Hotel Bristol. But while Hotel Bristol has stayed pretty much the same as before, Grand Café, with new owners, had a complete and total makeover of the dining room as well as its kitchen last year. The changes at Theatercaféen are far from as dramatic, but nevertheless for the better. 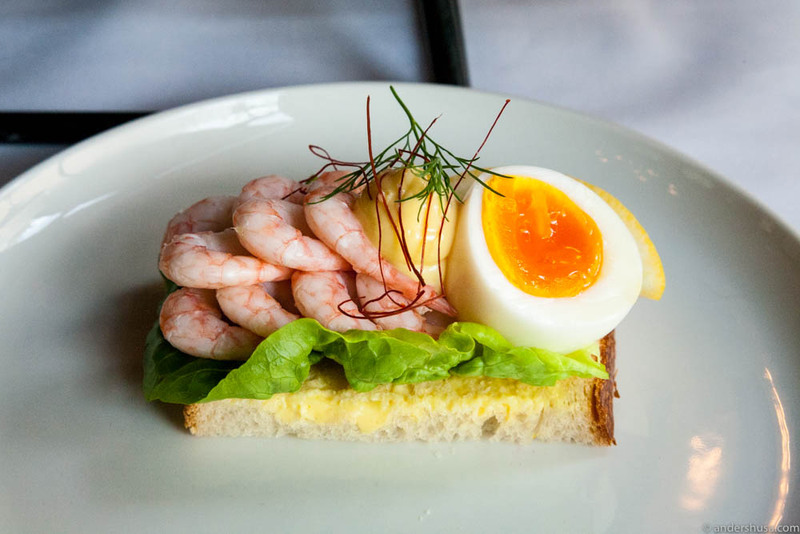 Executive chef Stig Drageide has raised the quality of the open-faced sandwiches to a level more similar to Renaa Matbaren in Stavanger, which in term is inspired by the well-known Danish sandwich entrepreneur Aamanns. The classic, yet dull and tasteless, white loaf has been swapped with proper flavorful, organic sourdough bread from Handwerk – specially made to match chef Drageide’s preferences. A precise rectangular shape to the bread and an elegant decoration of the topping make for mouth-watering and eye-pleasing presentations, while top quality produce and well-balanced flavors and textures satisfy the expectations. It’s a change that I believe the regulars will accept, and new customers will highly appreciate. After the savory dishes, we treated ourselves to a dessert from the large pastry and cake buffet at Theatercaféen. 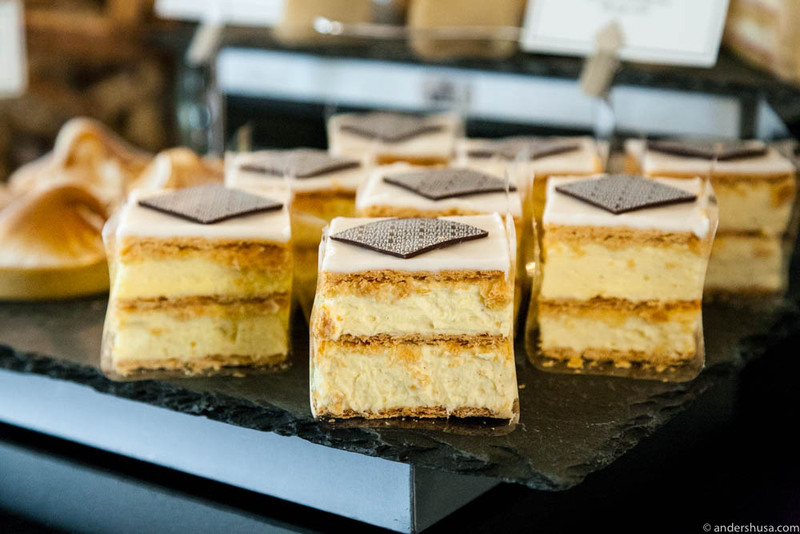 Head pastry chef Linda Roalstad explained the vast selection, ranging from a layer cake with marzipan lid and walnut filling, to American style brownies and cheesecakes. Ole Martin had already decided, though. His favorite: a mille-feuille custard slice known as the Napoleon. I’ll admit, I would have chosen the same, but instead, I suggested we could share. 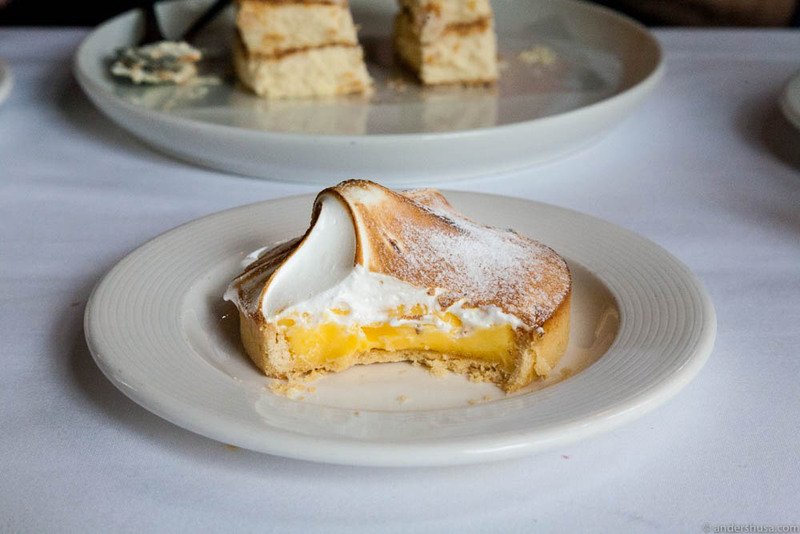 That way, I could pick my second most favorite as well – the lemon and meringue tart. Ole Martin reluctantly agreed. My parents are going on a trip to Piedmont in a few weeks, and we were supposed to join them but ended up having to prioritize differently. I asked Ole Martin on behalf of my dad for some recommendations on where to eat and which vineyards to visit. After all, Alfsen has written a huge book on the Piedmont region, in addition to all of his cookbooks. Later the same evening I got a long e-mail from him with superb tips for my parents. Because that is the kind of guy Alfsen is. Before anyone would mistake us for two old aunts eating cake for lunch, we asked for the bill and headed to Grünerløkka to check out the new store that Ole Martin’s girlfriend, Anna Andresen, has opened. A beautiful eco-friendly shop called Grenen, where she sells organic products and household items. Check it out! Update: The shop Grenen has since closed, both its physical and online form. 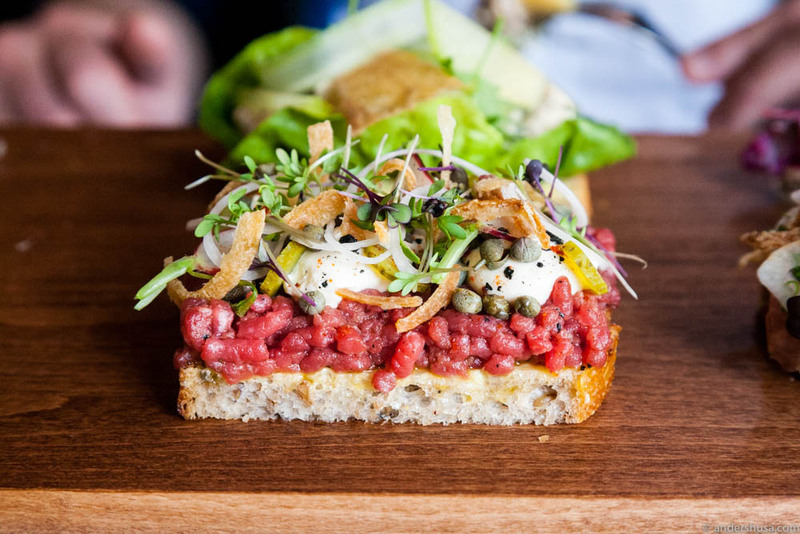 Where did you eat your best-ever open-faced sandwich? And do you prefer classic or modern presentations? Please share in a comment below.